On dress-down days, Sherlae’s outfits almost always include sequins and sparkles. Whenever she passes a window, she lights up, in a way that matches her sunny personality and big, dimpled smile. But for years, because of strife at home, she had to force herself to look cheerful each morning as she walked into her school, Lawrence D. Crocker College Prep in uptown New Orleans. “I always try to put on a happy, smiling — not sad — face,” said Sherlae, 13, whose middle name is used here to protect her privacy. Today, that smile more often reflects an authentic happiness, or “sunshiny-ness,” as Sherlae describes it. But when her mood clouds, she knows how to address it. After a recent sleepless night when her mom visited, talking loud, a bottle of whiskey in hand, Sherlae walked off the yellow bus and into Crocker’s social-work office, with its comfy rocker and bean bag chairs. 29 percent — Percent of New Orleans youth surveyed who said they worried about not being loved. Her favorite confidante is social worker Rochelle Gauthier. “She’ll talk to me. Or just give me tissues and hugs,” Sherlae said. All day long, a steady stream of Crocker students, feeling overwhelmed and needing to talk, ask teachers for passes to Gauthier’s office. Some students want reassurance that they’ll be okay after water or electricity is shut off at home; others are burdened with worries about a loved one who is sick, has been arrested, or even killed. Some, like Sherlae, are coping with a family mental-health crisis. 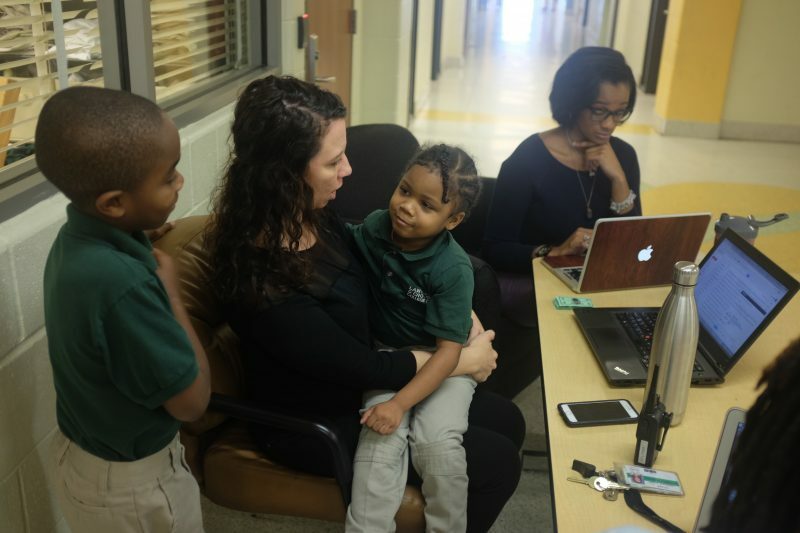 In New Orleans, Crocker is at the vanguard of a collaborative of five schools launched in 2015 by the city’s health department. At each school, educators, experts in psychiatry and development, and mental-health providers work together to improve academic achievement by establishing a place where students can feel a sense of belonging and safety. The rigid “no excuses” disciplinary approach kept students out of class, not learning. It simply didn’t work for about a third of suspended students, said Amanda Aiken, a College Prep administrator who was Crocker’s principal when the school began to implement a trauma-informed model in 2015. Armed with new knowledge, Aiken now keeps trauma foremost in her mind, even when interviewing teachers. “I always ask, ‘What is your struggle?’ Because if you can’t understand struggle, you can’t work here,” she said. All too often, New Orleans students have experienced serious trauma, such as shootings and other violence, said Denese Shervington, a board-certified psychiatrist who heads the local Institute of Women and Ethnic Studies and works closely with Crocker. “Over half of the kids we surveyed in middle school had someone close to them who had been murdered,” Shervington said. Almost 20 percent of the children surveyed said that they had personally witnessed a murder in their community; 54 percent experienced the murder of a close family member or friend; nearly 40 percent had been exposed to domestic violence, and 29 percent worried about not being loved. 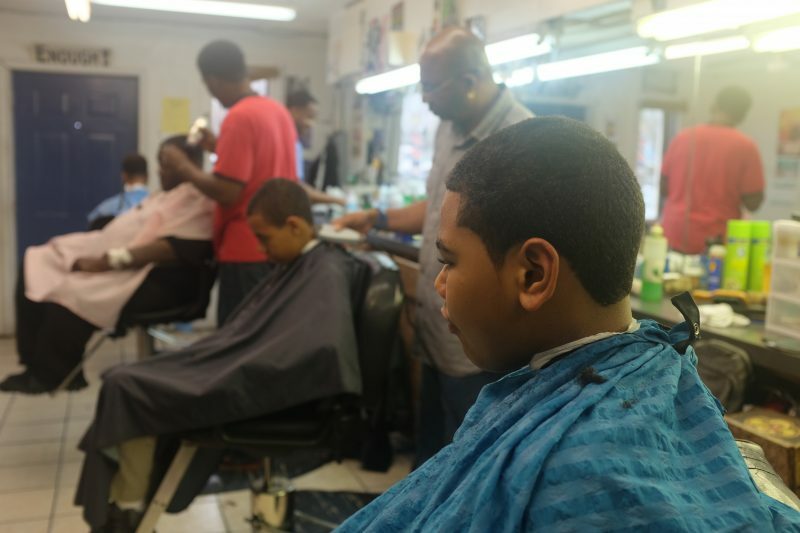 The Institute found that rates of Post-Traumatic Stress Disorder in New Orleans youth were nearly four times the national average. For Tulane University psychology chair Stacy Overstreet, a leader of the five-school collaborative, work with Crocker and other trauma-sensitive schools flows from her work in New Orleans’ public-housing projects, where she found shockingly high rates of children suffering the psychological effects of being exposed to violence. And when trauma and chaos are ongoing and chronic, the effects are even worse, she concluded. Not a day passes at Crocker where violence doesn’t impact someone. Recently, middle-school teacher Katie Murray walked into her first class of the day with red-rimmed eyes, after hearing that a former student, Tyre Smith, 18, had been found shot dead. “I told them, ‘This is really hard for me; he was someone I taught for three years,’” Murray said. Throughout that hour, she said, students came forward to hug her and tell her similar things had happened to them. Crocker’s work is part of a national trend, driven by a massive, landmark public-health study called Adverse Childhood Experiences, or ACEs, which showed that trauma, even among the study’s relatively middle-class participants, is far more common than previously believed. The study found that almost two-thirds of adults experienced at least one traumatic event during childhood, through exposure to violence or personal abuse and neglect, findings since replicated by a number of other large studies. While “trauma-informed” schooling might sound idealistic and even touchy-feely, it’s actually rooted in a series of practical steps, based on a significant body of research. The intervention begins with each school’s adults. At Crocker, teachers and staff were trained to recognize trauma and learn how it affects children’s development. They learned to structure each day so that students always know what’s coming next, because unexpected changes can rattle traumatized children. At a school-wide level, administrators shelved mandatory, zero-tolerance suspension-expulsion requirements, replacing them with more flexible procedures that try to get at the root of misbehavior. 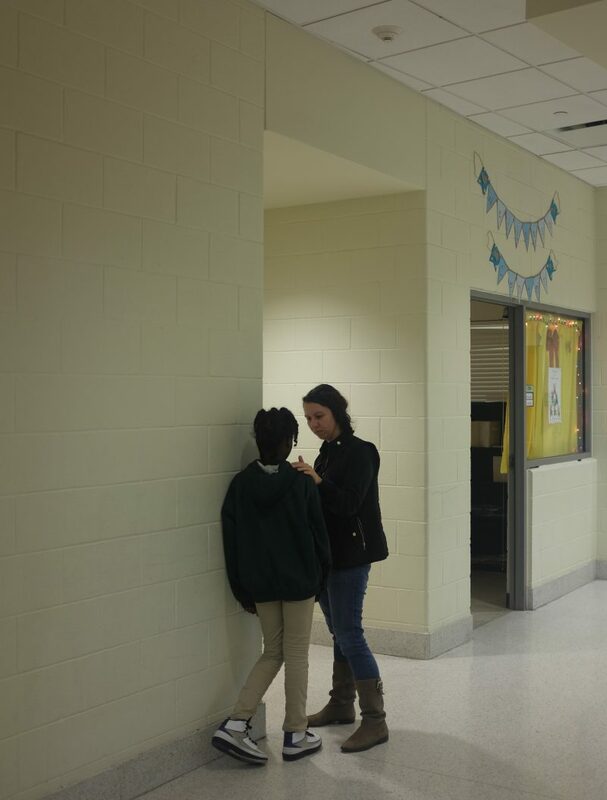 Students also became part of the change, learning how to support each other through one-on-one sessions with Gauthier and through classroom curricula devoted to teaching them how to be good friends, by asking questions and listening when others seem sad or angry. Traumatized children often can’t express what’s going on inside them, so they throw tantrums and disrupt classrooms. “Those students are trying to tell you something,” Shervington said. Others shut down. “The kid with her head down on her desk may be more at risk than the child who is acting out,” Shervington said. Teachers at Crocker have found that, once trained in trauma’s effects, they can detect them from even subtle clues. For example, the other day Murray sensed a change in an A student. Although usually diligent, he’d failed to turn in a project. When she asked him about it, he didn’t have an explanation. Other small things also seemed out of character, she said. Murray tapped into the computerized system teachers use to rate every student during each class period, a requirement of the trauma-informed framework. Teachers award each child a total of five possible points, for five different factors: how a student enters the classroom and exits to the next class, along with behavior, participation and completion of classwork. 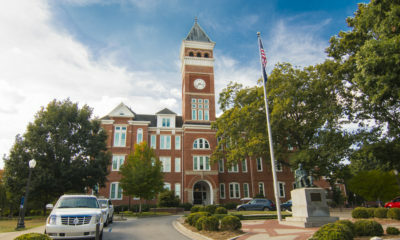 Murray found that the A student had dropped from five points to three or four in nearly all of his classes. She referred him to Gauthier and now knows that the student had gone through some upheaval at home and was adjusting to living with his grandma, not his mother. 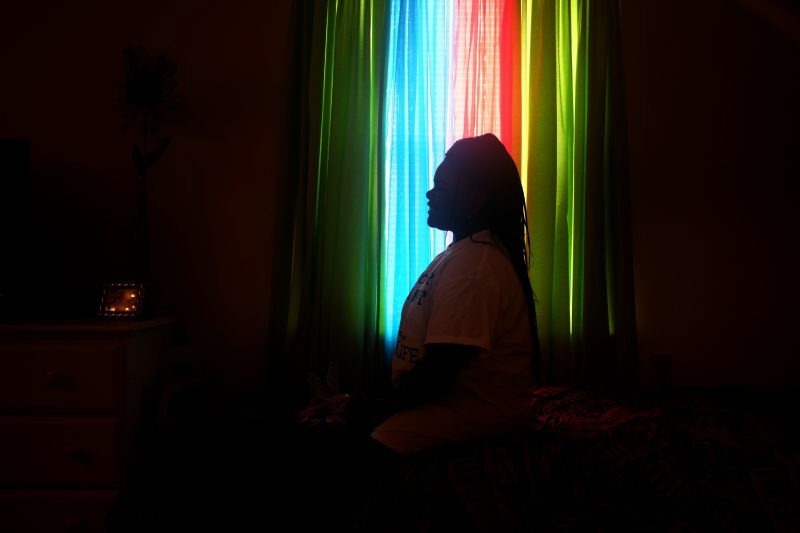 Last year, Gauthier began to actively seek out the school’s quieter — and possibly “shut down” —children, after several, including Sherlae, became suicidal. Sherlae has lived with her grandmother since she was about three, when her mother, who is bipolar and schizophrenic, stopped taking her medicine and turned to alcohol. There have been some periods of sobriety and calm, at these times Sherlae and her mom go on lengthy bike rides or walk to the library to research Sherlae’s book reports. “It can be so joyful,” Sherlae said. But it can change quickly. A few years ago, during a lengthy bender, Sherlae’s mother became physically abusive and cruel. “She put her hands on me. She told me didn’t want me in the world,” Sherlae said. Her grandmother remembers Sherlae’s reaction. “It crushed her,” she said. Ashamed, Sherlae told no one. For weeks, she did nothing at school but put her head on her desk. She couldn’t pay attention. Her grades plunged to Fs. She wanted to hurt herself. When she told a teacher she felt suicidal, the teacher sent an S.O.S. through the school’s message system, reaching Gauthier, who pulled Sherlae out of class. Sherlae used to keep her emotions to herself. But now, thanks to guidance from Gauthier, she writes poems in her journal or talks with her two closest friends when she feels upset. Or she seeks out music, usually the song, “Cry,” by Alexx Calise, she says, digging in her sparkly aqua backpack for her small smartphone with its shattered screen. She hits play, then sings quietly along. “It speaks to me,” she said. “Young people try to normalize violence, but inside they’re very frightened and worried,” Shervington said. And though research has shown that strong extended-family and community networks can help mitigate the effects of violence for children, in New Orleans such networks were scattered by the massive, unprecedented evacuations 11 years ago after Hurricane Katrina and are still incomplete. Networks are especially strained in the city’s poorest neighborhoods, where recovery has been slowest, Shervington said. 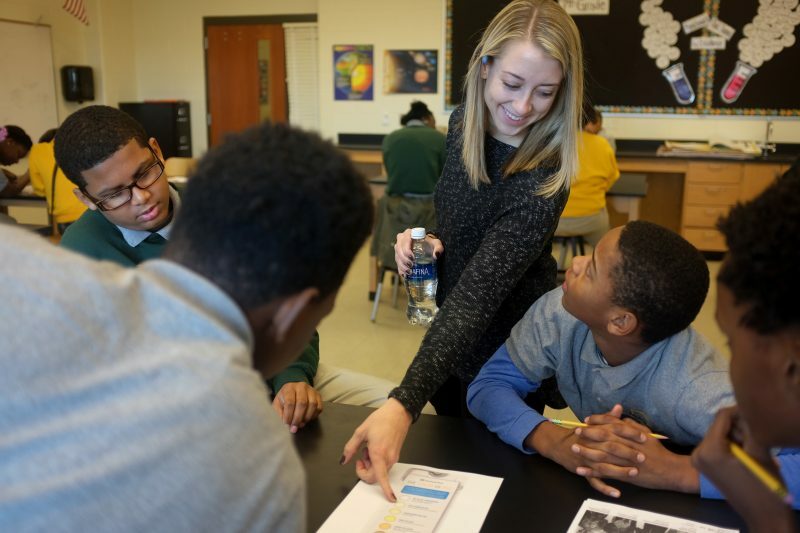 When students are viewed as “sad, not bad,” they can let down their guard and relax, said longtime New Orleans youth advocate Kathleen Whalen, another leader in the five-school collaborative. “School can be a good place to give your hippocampus a chance to catch up,” she said, referring to an area of the brain that is particularly sensitive to traumatic stress and essential to learning and memory. Research to date shows that most — maybe 80 percent — of children who have trauma histories will thrive in a trauma-informed environment without further interventions, Whalen said. When students need individual support, the collaborative’s mental-health providers step in. 54 percent — Percent of New Orleans children in a local survey who experienced the murder of someone close to them. At least 20 states have implemented trauma-informed schools at some level. Since 2014, the National Conference of State Legislatures has supported a “strong state-federal partnership” for trauma-informed education and awareness; last year, the concept was referenced for the first time in the federal Every Student Succeeds Act. Massachusetts, Washington, and Oregon, among other states, have established wide-ranging resolutions or initiatives, as have some city school districts, such as San Francisco. In other states, like Louisiana, mere clusters of schools are trying it. The approach is an about-face from the punitive, “no-excuses” mindset that became common in many schools in the mid-1990s and led to a national spike in suspensions and expulsions. In some ways, it was the sheer ineffectiveness of the no-excuses model that created an opening for the diametrically different, trauma-sensitive practices. “We realized that you can’t suspend your way out of trauma,” Aiken said. So, at Crocker, punishment is no longer automatic. A teacher must discuss students’ behavior with a dean before putting them out of class or giving them a lunch detention. Murray feels her training helps her interact more effectively with students. After learning that a girl prone to tantrums had been raped at a young age, Murray suspected that the girl’s development might have been halted by the trauma. “I began addressing her as someone who was emotionally younger,” said Murray, who found that the girl flourished when given rewards such as bright stickers, something most middle-school students no longer respond to. Murray also announces in advance what the class will be doing each hour and gives gentle reminders about any upcoming schedule changes. “Some of our students can get upset about things that are seemingly small,” Murray said. “If we are dismissing from a different room that day and a student’s jacket is in the other room and he can’t go get it, that can lead to a blowup,” she said. Crocker teachers have also learned to acknowledge their own triggers — how, for instance, a certain hairstyle or fashion can cause them to see a child as defiant. They learn to call in help when they recognize they’re angry. Whenever Murray feels herself becoming exasperated, she can send an instant message that brings a fellow teacher to her classroom within minutes to take the situation off her hands. 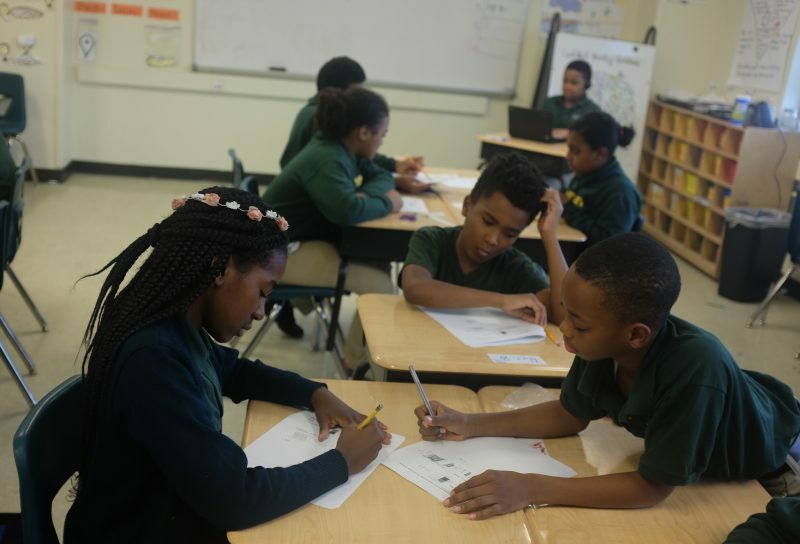 Overstreet and her team recently began gathering baseline data as part of a controlled $2.6 million National Institute of Justice study focused on schools in the New Orleans collaborative. Using a number of criteria, including reduced school violence, fewer expulsions and suspensions, lower rates of teacher burnout, and several measures of academic success, the study will determine what factors make trauma-informed approaches effective. Evan’s mom can’t single out the factors that made the phone calls stop once her son transferred to Crocker. All she knows is that something changed. “I will give Crocker credit beyond credit,” she said. Evan (his middle name), is only 11, but his mother spent his entire school career fielding phone calls from teachers at each of the six schools he had attended. Things got even worse a few years ago, after Evan’s father finished medical school and moved out of state for a residency. Eventually, his mother’s work – first as a student in law school and then as a lawyer – began to take second place to Evan’s school emergencies. “For years, I deliberately and strategically structured my day around my ability to get to where he was,” she said. Evan, a physically restless child with an extraordinary vocabulary, can recount each of the six schools he’s attended. The one where he loved his teacher but was expelled after having a tantrum and throwing his shoes at a librarian’s head. The Catholic school where he was expelled for flipping over a desk. The mother had enrolled Evan’s older brother at Crocker while she searched for a school with higher academic scores. But, with no other options, she eventually settled on Crocker for Evan as well. And that was when her phone stopped ringing, she said. At first, Evan still flew off the handle, especially if his Crocker classmates made any cracks about his family. “I would start feeling like my stomach is a bottomless pit and my heart would stop a little bit,” he said. He was once a near-daily visitor to Gauthier’s office. Not anymore. That’s because of expanded coping skills, Gauthier says. Recently, Evan flopped happily into a beanbag in Gauthier’s office after a Donuts with Dads event that his father had driven in for, as a surprise. Still, when his dad is two states away, he knows that he will occasionally feel that sensation in his stomach. At that moment, he’ll turn to the support network he’s built for himself at Crocker. “If I’m down, there are at least 10 people who can run to my side, asking ‘What’s wrong?’” he said.